Steven Underwood is a prose craftsmen that explores his ancestral roots in art and storytelling by exposing identities' complex nature through fiction's exposing eye. Bio: Steven Underwood is the recipient of the 2018 Eugene A. Noble Award for Leadership and Enthusiasm from Centenary University. Hailing from Columbus, Ohio, he retains a Bachelor’s in English: Creative Writing and wanders fiction shelves employing his academic powers to investigate where it says exactly that Black kids can’t be wizards. 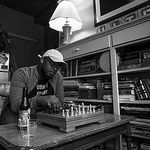 A champion of black lit equally in speculative fiction and nonfiction, Steven has previous published with Banango Street, Epicurean Commune, and PRISM. Currently, he curates and critiques America from the lovely handle of @blaqueword and is unapologetic in his approach to culture and community. Success! Ebony Antebellum sold 5 pre-orders by Jan. 27, 2019, was pitched to 3 publishers, and will be self published. 1 Copy of the autographed limited edition of the book "Ebony Antebellum" + Free invitation to the book launch. You ALSO get exclusive access to updates and an invite to join my community. 2 Physical Copies (One for you and one for a friend) of the autographed limited edition of the book "Ebony Antebellum" + Free invitation to the book launch. You ALSO get exclusive access to updates and an invite to join my community. 3 copies of the autographed limited edition of the book "Ebony Antebellum" + One story from Underwood's new in-progress novel, "American Witch Doctor" + Free invitation to the book launch + A Big Thank you mention in the book. 5 copies of the autographed limited edition of the book "Ebony Antebellum" + Free invitation to the book launch + Your name mentioned in the book + FREE one hr of Writing Consultation critiquing a Creative Work of your choice. 10 copies of the autographed limited edition of the book "Ebony Antebellum" + invitation to the book launch + Your name mentioned in the book + Invitation to private live stream showcasing Steven Underwood completing next novel/short story work with Q&A sessions every 500 words + FREE Short Story of a character of your choosing. 20 copies of the autographed limited edition of the book "Ebony Antebellum" + Free invitation to the book launch + Your name mentioned in the book + FREE Collection of Short Stories and a Novella showcasing Victor Mesa's experience with Tyree gone. 25 copies of the autographed limited edition of the book "Ebony Antebellum" for you and your team + Free invitation to the book launch for you and 2 members of your team + Your company's name mentioned in the book as a Sponsor + A half day workshop for your team teaching and networking the art of writing and professional writing as a business. After being tasked to betray his People for their own good, a Black teen thug uses his street-smarts, cultural magic and icy wit to survive the deadliest school of magic. Magic returned, and whether it was the Adversary who followed it or the warfare -- America couldn't survive it. Torn apart by a world truly made equal, the last scions of humanity peeled apart the earth and created a New World out of what remained: the Last City, Antebellum and put up a Wall to split the city: one side for wonders and the other side for everyone else. All seventeen-year-old Tyree DuBeau ever wanted was two things: to cure his ailing mother, avoid incarceration and to not wind up dead by the hands of Antebellum's government approved killers, the Coven Marshalls. But, when thrust into a Black man's worst nightmare, Ty must make a deal with his local crime lord and community organizer and abandon the street life that raised him, enrolling at the deadliest finishing school for the City's future enforcers and leaders specializing in all forms of oppression, a place known only as the Orthodox of Magic. The wealthy students of the Orthodox understand victory is not a question of can you succeed, but a question of what you will kill to do it; and if its them or him, Ty will learn what little value a Brown boy truly holds in a world on the brink of destruction. Ty studies turn from political to something far more sinister as his old home descends further into rampant chaos as incarcerations rise and the dark instruments of war play their perish song and seek to destroy the city for crimes it is very likely guilty of. The story begins with a Boy in the Browns, showcasing the struggles and tribulations of the city's ghetto district: the Browns, while also the racial and cultural beauty of the place that has become a subculture all its own even though most of these people work on the opposite side of the Wall, serving the "Blues". In this section, Tyree's circumstances thrust him into the hands of the "Blue Bloods", the magical elite, who will kill him before allowing someone from the other side of the Wall from becoming a Marshall. We're introduced not to one, but several forces that are conspiring an agenda -- and now each of them have placed Tyree into the middle of them. The next section looks at the Conservatory of Magic, a finishing school for the most elite of the City. Those attending this place aspire to become courtisans, senators, tastemakers and leaders. It is said the future of the City can be glimpsed in a report card here. The school also trains the Law Enforcement -- allowing the priviliged to hand-pick future personal enforcers and guards. No longer able to return home, Tyree is constantly surrounded by threats to his life. A secret society seems to be working to end Tyree before he has an opportunity to even fail. The final section is War in Antebellum, as Tyree has finally exposed each of his enemies, and now they're making their own bids with Tyree's graduation lingering in the distance. However, Tyree is no longer alone -- and this City will either end or surge before the end of this evening. 1,386 followers on twitter, who factor into 20,000 impressions thanks to numerous followers including industry professionals, writers, musicians and taste-makers within their own fields. I've started the construction of a email list and will leverage my network with writers and social media brand influencers (such as Demetrius Harmon, Kehlani and Kenni Knox) whom involve themselves with my craft to build my debut novel for a grander release among my audience. Thanks to my education in social media marketing, I understand how important metrics are to increasing the performance of your marketing tools. I am looking to forward more than two-thirds of my advance into my own marketing to ensure the continued success of my novel. Following the success of brands targeting my specific demographic in using social media ad space to market, I believe that I will cultivate my strategy to ensure that I not only double -- if not triple my following -- but transform all of my potential customers into endorsements. My personal blog is located at www.blaqueword.com, where I average at least 500 clicks a month depending on the traffic. While I haven't participated in boosting my in-process novel on this platform, I have started building my contact list by using my blog as a formal reflection of trajectory as a writer. Many whom visit have commissioned me for professional work -- mostly in ghostwriting -- and I look forward to applying the marketing strategies I've learned from them to engage my potential audience. The Magicians, Lev Grossman, Viking, 2009: A depressed young adult searching for purpose enrolls into a magical university in Upstate New York, but finds that purpose is a lost magic of its own. The Bartimaeus Trilogy, Jonathan Stroud, Hyperion, 2003: After a humiliation by his Master's superior, a young British magician summons an ancient djinn to assist him in getting revenge and destroying an enemy 20 years his senior. The djinn himself will comply, just as long as he gets to kill Magicians and snark. The Paper Magician, Charlie N. Holmberg, 47North, 2014: Recent graduate magician, Ceony Twill wants to be a Smelter. Unfortunately, when a shortage of Paper magicians turns up during her graduation -- Ceony is forced to study the dull and underestimated art of Paper Magic. A compromise? Her Master is extremely attractive. The Night Circus, Erin Morgenstern, Doubleday, 2011: Two magicians are raised to adopt their Master's centuries spanning war to find out who is the superior magician at a Circus as the culture of the American 1920s shoots up around them. The situation is made far more perilous when they fall in love. Children of Blood and Bone, Tomi Adeyemi, Henry Holt Books for Young Readers , 2018: Zélie Adebola seeks to liberate her race of magi from the brutal oppression of the king -- while falling for his son. Three Parts Dead, Max Gladstone, TOR Books, 2012: A God has died. Now a league of mystical lawyers and priests begin a legal battle to discover who shall take their place -- an inherit their magically-driven metropolis. Akata Witch, Nnendi Okorafor, Vikings Children, 2011: A young Nigerian Albino girl discovers she is a Leopard Person, a sorcerer. She and her friends must use their ancestral magic to protect the world from an evil sorcerer who preys upon children for sport. There was something wicked in these excellent ghettos and it slipped in from across the Wall. Quinto Glover sniffed it down the second it landed – a pungent odor of fuchsia and dandelion, typical fragrances of the wealthy who ruled the territories from that side. It couldn’t have gotten far – not here in his home. No matter how these streets have decayed in the devastation of the Great Fires, every nook and cranny of the Browns drew power from the Brownies therein: Black, Hispanic and every color of that cultural rainbow. Quinto zeroed in on the wickedness, his cane clacking against soot covered asphalt. It’d secreted itself in a dilapidated part of his territory entitled “the Back-of-the-Wall” duly from its location, and how the Wall’s grand shadow cast upon the ghost town. Once, the condominiums, boutiques and a few illegal markets overpopulated the streets. Now, all Quinto found a wasteland of blackened wood and brick, abandoned by all but the whispering horrors and chilled corpses of the ones who couldn’t outrun the flames – or the fiends that followed their dying embers. Their writhing shadows kept Quinto hurried along the barren streets, praying to his Ancestors, the powers and Art that so saved him in his youth. Quinto didn’t often carry his frail old bones through these parts alone, but circumstances demanded it. He trusted no one to face this wicked parasite, save himself. Along the road, Quinto found a few corpses hanging from the windows. Mostly skeletons, but amongst the clutter was a frost-bitten corpse. She was nine, maybe a little under 100 lbs: her casket wouldn’t be too expensive. She must’ve come out here on a dare, Quinto frowned. No matter how many decrees he made, a child always tried to prove herself to the Community in an act of daring in spite of the living dangers of these parts. Push on Old man, Quinto said to himself, before you lose the scent. It’s already hard enough thanks to that… thing! Quinto, of course, referred to the Wall, a colossal pale fortification stretching many dozen leagues in either direction and so tall, it tossed an oppressive shadow over half of the Brown’s territory. If Quinto closed his eyes, he could almost hear the screams of terror from the Walls prisoners, their magic turned sour within its corrupt influence. Almost in recognition of its crownless king, these damaged parts of the Brown’s seemed to bow in reverence. If only the sunlight had such a regard; sadly, the white light of day was owned by his people’s oppressors. It would not bend to him without proper coaxing. Quinto’s eyes wincing in the sunset, he chanted a phrase of power and the sunbeams parted around him. Not as if by magic: but by magic alone. The same magic that allowed the magically artificial sun to shine, as it did the City to run, the wind to blow. The magic that allowed life within a bubble in the middle of an eternal winter wasteland on the Eastern coast to exist. The contents of this city, Antebellum, was a patchwork – all parts snatched from one great American city or another after the Awakening. It took years to scrub the blood off of most parts, but they succeeded. A lot of the Blue districts, those places across the Wall, were made from the East Coast – its tall towers enamoring the elite. The Browns, however, came from so many disenfranchised and broken cities of the Midwest: some parts of Columbus, Chicago, and Detroit… They were the cities most harmed by the Adversary, and its stain never completely left. A soul-shattering grey sickness hung over the Browns. At least, not before Quinto’s time. But in a year? Maybe. “I’d never… so openly.” Her arrogant smirk made bile raise in the back of Quinto’s throat. Quinto wanted to get this over with quickly. By betraying protocol, this girl might have alerted others to her presence. If an accident didn’t happen soon, it would be a miracle. While she inherited all of her father’s talents for predestination, as a woman, she had none of his political nuisance. She was right. The magic of the Browns had failed before. Years prior, when the armies of street shamans protecting their blocks numbered thousands, there were now only a few dozen in their collective. “Give me the name.” Quinto said, his mouth losing moisture by the second. She strutted across the scene as crates and a large recliner ejected themselves out of her path with the list in hand. Quinto took it in his frail, spotted hands. Quinto narrowed his eyes and raised his Presence. The bricks all over them trembled, the air bent with intense heat. The fences around them wilted like a dying rose and his cane wound about until the wood became leathery red scales and the pommel a writhing cobra head. It hissed in her face, flinging venom across her cheeks. She didn’t even flinch. “Your ego is wounded, Quinto. Calm yourself.” The Enemy smiled and stroked the serpent on its head. It snapped at her, wrapping barbed fangs around her fingers. The Cobra’s teeth were a cloud of wood dust and splinters. They thing retreated back in fright. The Enemy giggled and pressed, slowly spreading her malice until the cane was a three inch length of wood in Quinto’s hand. “Quinto, I don’t want to fight here: I have no time for anything that isn’t a challenge. This request is a generosity, and completely within your realm to let happen, but I’ll make it easier for you. All I’m asking of you right now is to remove your veil of protection from around him, leave him to me and my wolves and by the end of tomorrow,” the Enemy smiled, her lipstick the color of the blood frozen in Quinto’s veins. “Every single one of your soldiers still within your protection will find their lives much less difficult. on Dec. 28, 2018, 3:50 p.m.